Bill's OBX Beach Life: 4runner is Back on the Road/Sand!! 4runner is Back on the Road/Sand!! After 4 long weekends, my new engine is complete and the 4runner is back in action to haul my sandy windsurfing, surfing, and other beach gear around the OBX! The odometer currently reads 368,226 miles, and with the new engine the truck will have plenty of trips to Avon/south beaches back under its hood! The engine swap was one of those "once in a lifetime" events for me. I jumped out of a airplane, surfed some big waves in Hatteras, windsurfed extreme conditions...(well you all are familiar with the windsurf part), and now did a complete automotive engine swap. The engine swap was a learning experience, and it is now nice to know almost the full workings of the 22RE engine. Thanks a million to Keith M who guided me though many of the processes (he is a 22RE expert! ), and physically helped me pull the old motor, and install the new. Definitely a two person job! Also thanks to Pete L, who came up and cut me some new threads on my intake manifold after a bolt broke. CRISTOBAL UPDATE: Got the report from Keith M, that he and Caleb experienced classic Cove yesterday. Only drawback was the "price of admission" since there is no driving or even walking at the Cove due to the beach closures. They launched at LifeGuard Beach and sailed around Cape Point, to enter the Cove. Keith reported head to overhead high perfect and easy long lines peeling for over 100 yards! Definitely classic Cove! He also reported that the return to LifeGuard from the Cove was dicey given a wind shift and drop, along with the crazy current. Definitely, if you wish to sail the Cove these days, the challenge just to get there is the main price to pay. Glad those guys caught it! In TS CRISTOBAL news, we had strong SE winds most of the day on the southern OBX yesterday. I have not heard any "after action" reports yet, but preliminary reports note Ocracoke and the southern beaches as the spots where the local crew set up shop to hit the water. I missed the action yesterday since I had no wheels to haul the gear down south, but now that the 4runner is back, I am ready for the next sesh! You swapped the engine of your truck? 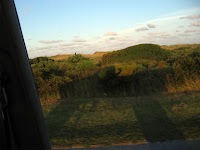 Hatteras Loop Fest 2008 - A Great Success! !